1929: (W Wallace & Roderick G) Kellett Autogiro Co, Philadelphia PA. 1943: Kellett Aircraft Corp. 1970: Kellett Corp. c.1987: Bankruptcy, some parts and equipment sold to Piasecki. The name Autogiro, spelled thusly and capitalized, was copyrighted by Pitcairn Co in 1923, but eventually became generic and often was used interchangeably with the lower-case autogyro. G-1 - Wingless 2pOAg; 225hp Jacobs R-775; rotor: 40'0" length: 28'10" v: 125/x/0 (data for YG-1B). From KD-1 series. YG-1 1935 = POP: 1 modified commercial model [34-278]. YG-1A 1936 = Radio installed. POP: 1 [36-352]. YG-1B 1937 = POP: 7 [37-635, -37/382], of which 1 became YG-1C/XR-1 and 1 later redesignated as XR-3. YG-1C 1937 = YG-1B modified with constant-speed rotor. POP: 1 [37-378], redesignated as XR-2. H-8, -10 - Redesignations from XR-8, -10. 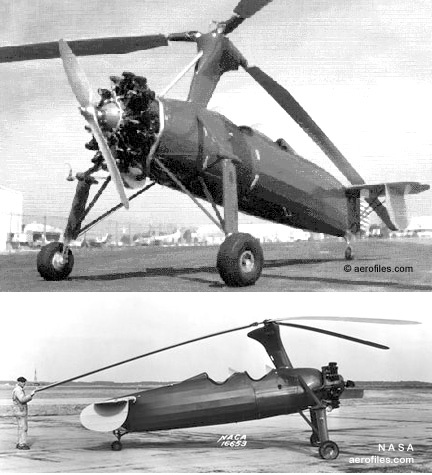 H-17 1952 = Large, jet-rotor CH flying crane developed under contract as Hughes H-17 (qv). K-1X 1930 = 1pOAg; 40 hp Szekley, later 65hp Velie M-5; rotor: 27'8" length: 24'6". Fred Seiler. Featured an unique, single-blade, wooden rotor that see-sawed on its rotor hub. The craft suffered from structural problems and unsound aerodynamic design, so several taxi runs were made with no flights, then the project was abandoned [919N] c/n 1. K-2 1931 (ATC 437, 2-351) = 2pO/ClwMAg; 165hp Continental A-70; rotor: 41'0" span: 26'0" length: 19'6" load: 649# v: 95-100/82/10-15 range: 250 ceiling: 9000'. W Laurence LePage (K-series). Direct-drive. Side-by-side seating; convertible coupe-type top. $7,885 open cockpit, $8,255 canopied cockpit; POP: 14 [NC10766/10767, NC11666/11668, NC11683, NC11685/11687, NC11691, NC12603, NC12605, NC12615, NC12633], with some modified into K-3 and -4. 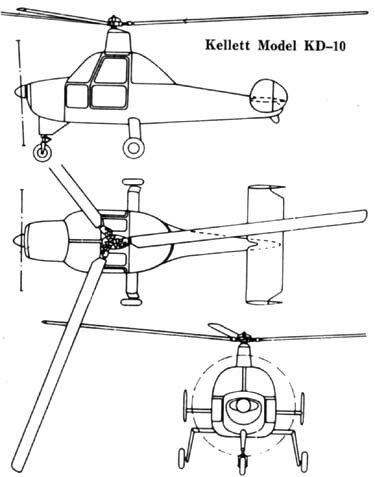 Rotor design and tradename later licensed by Autogiro Co of America (Pitcairn). (2-351) for prototype only [X10766] c/n 1. [NC10767] c/n 2 restored to flying condition in 2001 by Al Letcher, Mojave CA. K-2A 1932 (ATC 2-431) = 210hp Continental R-670. POP: 4 conversions from K-2. K-3 1932 (ATC 471) = 2pO/ClwMAg; 210hp Kinner C-5; rotor: 41'0" span: 26'0" length: 19'6" load: 753# v: 110/90/15-20 range: 250 ceiling: 10,000'. Landing roll less than 50'. Side-by-side seating. $8,135; POP: 11, including conversions from -2 [NC10767, NC12605, NC12615, NC12633, NC12671, NC12673, NC12691, NC12693, NC13151, NC13181, NC13186]. [NC12615] c/n 18 went with Adm Richard Byrd on his 1933 Antarctic Expedition, where it crashed and is still therebring a shovel with you. K-4 1933 (ATC 523) = 2pOlwMAg; 210hp Continental R-670; rotor: 40'6" span: 24'7" length: 19'11" load: 655# v: 110/95/0-15 range: 310. POP: 1 modified from K-2 [NC11666]. KD-1 1934 = 2pOAg; span: (wingless) length: 28'10". 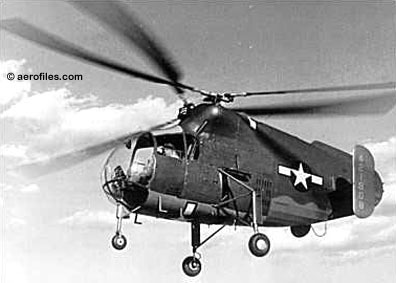 No ailerons, rudder, or elevator; directional control was through a pivoting rotor head modified under license from the Cierva invention. Folding rotor blades, required a storage area of only 29'10" long, 10'4" wide, and 10'3" high. Made the first landing of an autogyro on a rooftop, at the Philadelphia post office, May 1935 (p: Lou Leavitt). POP: 1 prototype [X14742], which became KD-1A, and 1 to AAC in 1935 as YG-1. KD-1A 1937 (ATC 712, 2-513) = 1-2pOlwMAg; 225hp Jacobs L-4; rotor: 40'0" span: 0' length: 28'10" load: 645# v: 125/100/0-15 range: 310 ceiling: 12,000'. POP: 3; [NC15684] to AAC as YG-1A, [NC39Y], and [NC14742] converted from KD-1. KD-1B 1937 = 1p cargo version; load: 620# v: 127/104/0-15 range: 220. POP: 7 to AAC as YG-1B and 2 civil [NC39Y, NC15069], the latter used on first autogyro air mail route, from Philadelphia PA to Camden NJ, in 1939 [. KD-10 - Proposed (c.1960) all-metal 2p autogyro as liaison or observer aircraft; 260hp Continental IO-520 or Allison T63-A-1 turboprop. Not built. KH-2 - Chubby 8-passenger jet "skybus" project only made it as far as mock-up for a 1947 trade show display. Estimated cruise: 118. KH-15 1954 = USN. 1pOH propelled by small hydrogen-peroxide rockets at the rotor tips; ff: 5/13/54. POP: 1 for testing by the Office of Naval Research . O-60 1942 = Similar to XR-2. POP: 7 as XO-60 [42-13604/13610], the first 6 of which became YO-60. R-2, -3 193? = POP: 2 redesignations from YG-1B and -1C as XR-2 [37-378] and XR-3 [37-380]. 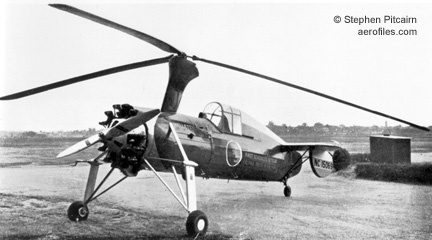 R-8, H-8 1944 = 2p KH-1; 245hp Franklin O-405-9; rotor: 36'0" length: 23'0" v: 105/85/0 range: 470. Intermeshing rotors. POP: 1 as XR-8 [43-44714] and 1 as XR-8A [44-21908], redesignated as XH-8. 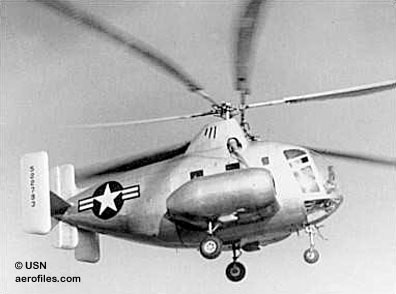 R-10, H-10 1947 = USN. 10p R-8; two 425hp P&W R-985; rotor: 71'0" length: 29'2" v: 105/x/0 range: 350. Intermeshing rotors. 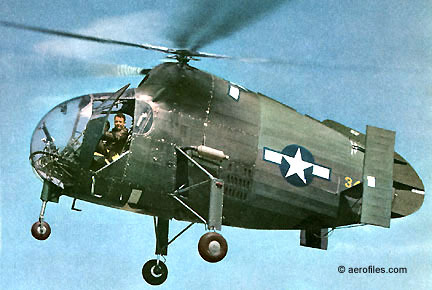 POP: 2 as XR-10 [45-22793, -22795], redesignated as XH-10.